The Vegas Golden Knights were listed as -155 favorites to win the Stanley Cup Finals. But Vegas, which was a 500-1 long shot before the season, opened as a minus 160 series favorite at multiple Las Vegas sports books to defeat the Washington Capitals (plus 140) in the Stanley Cup Final. The Knights are minus 155 favorites over the Capitals (plus 135) at Station Casinos in Game 1 of the best-of-seven series, which starts Monday at T-Mobile Arena. The total is 5½ (Under minus 120). The early action Wednesday night at Stations was on the Knights in Game 1 and on the Capitals in the series, according to Sunset Station sports book director Chuck Esposito. 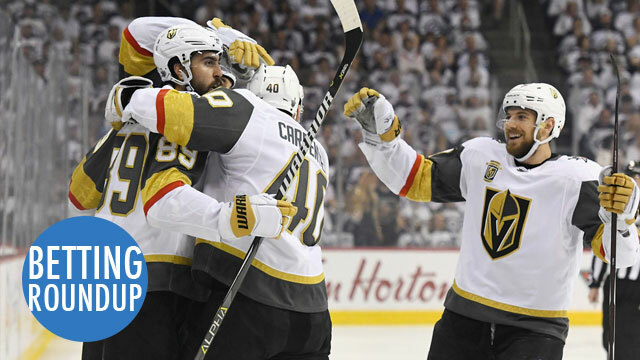 Vegas, which is 6-1 at home in the playoffs, secured home-ice advantage when Washington beat the Tampa Bay Lightning 4-0 on Wednesday in Game 7 of the Eastern Conference Final. A New Jersey lawmaker encouraged every state to reject the “integrity fee” professional sports leagues have been asking for with widespread legal sports betting. “And their demand begs the question of what they would now start doing to preserve the integrity of their games that they have not been doing for years,” Sweeney added. NFL Commissioner Roger Goodell urged lawmakers to enact “uniform standards” for states that legalize sports betting. Regulators from four states said they would prefer to keep regulation at the state level. A statement on Tuesday issued on behalf of four state regulators by the International Center for Gaming Regulation at the University of Nevada, Las Vegas, concludes that “coordinated action among jurisdictions” — states and tribal agencies — is the key to stopping illegal betting and possible corruption of the sports themselves. Although the regulators welcomed “strong support from federal-level enforcement agencies,” they took a direct swipe at the leagues, several of which have suggested that betting houses pay a fee to the leagues for the right to use their data for gambling. The leagues have suggested that the fee would also help pay for new measures to protect against things like match fixing and improper wagering. Although the statement was signed only by the gaming control commissioners of four states — Nevada, Massachusetts, Louisiana and Michigan — other states also appear to be at odds with the suggestion of federal oversight. DraftKings announced a new sportsbook earlier this week. Paddy Power Betfair purchased FanDuel. Dublin-based gaming company Paddy Power Betfair announced it had completed an acquisition of daily fantasy sports site FanDuel on Wednesday. The two parties await final regulatory approval and expect the transaction to close during Q3 this year. That PPB was in talks with FanDuel was first reported by Legal Sports Report last week. The news comes as the US Supreme Court struck down the federal ban on single-game wagering last week in the New Jersey sports betting case. It appears likely that decision triggered an escalation in talks that were already underway. “We are excited to add FanDuel to the Group’s portfolio of leading sports brands,” Peter Jackson, CEO of Paddy Power Betfair, said. “This combination creates the industry’s largest online business in the US, with a large sports-focused customer base and an extensive nationwide footprint. The PGA said they are ready to help offer shot-by-shot live betting on their events. ESPN Chalk compiled a timeline of the path to legalized sports betting. For 26 years, the Professional and Amateur Sports Protection Act of 1992 made the business of bookmaking illegal in all but a handful of states, most notably Nevada. Much like with alcohol during the Prohibition Era, those interested in betting on sports outside of Nevada simply participated in a thriving black market that’s believed to handle an estimated $150 billion in bets annually. A room that was essentially a Formica-lined cafeteria received a $3 million dollar face-lift that started five years ago as the operator of the track and one of the world’s biggest sports betting operators formed a partnership to wager that New Jersey would prevail in its legalization efforts. Some universities have said they want a piece of the action with legal sports betting.